Was here on Wednesday of last week, its fast becoming an institution in Dublin for Wagamammas after work. The food here is so fresh and clean and at the same time very reasonably priced. When myself and Joanne arrived it was fairly quiet so we were so served so fast, but by the time we had left it was jam packed. I got the Chilli Ramen, which was delicious. 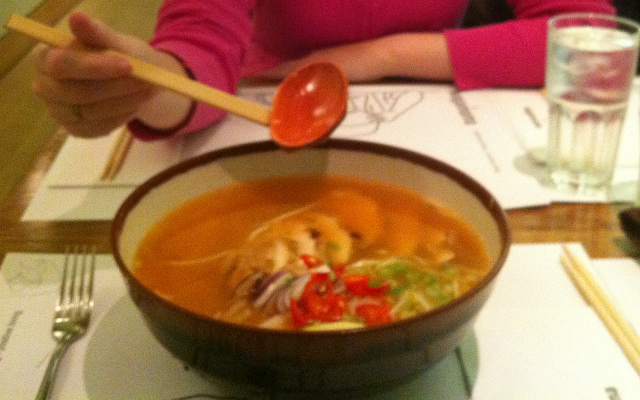 Its a huge bowl of ramen noodles in hot n spicy soup with a breast of chicken and beansprouts. Again another fairly cheap eat, but for the amount of food you get 13 euro is a steal. It was my first time there and most certainly wont be the last.